"The Travelling Symphony: Because survival is insufficient." In present day Toronto a young girl name Kirsten is playing the part of the young Regan in King Lear. She witnesses Arthur Leander, the aging film star playing Lear, have a heart attack and die on stage. Two weeks later a pandemic called the Georgia Flu has killed most of the world's population. Fifteen years after that, the Kirsten travels the former United states with a group of actors and musicians called the Travelling Symphony performing Shakespeare to people in a harsh world almost entirely devoid of culture. Every day they battle the elements, diseases that didn't kill people in the days of antibiotics and vaccines and other survivors with different ideas how things should be organised. Finally the Symphony comes up against the followers of a man calling himself The Prophet who threatens their already precarious existence. Station Eleven weaves together the stories of a group of survivors. It skips back and forth between events that happened before, during and after the outbreak. The book takes its title from a series of comic books written before the Flu, which Kirsten treasures and carries with her in her backpack. 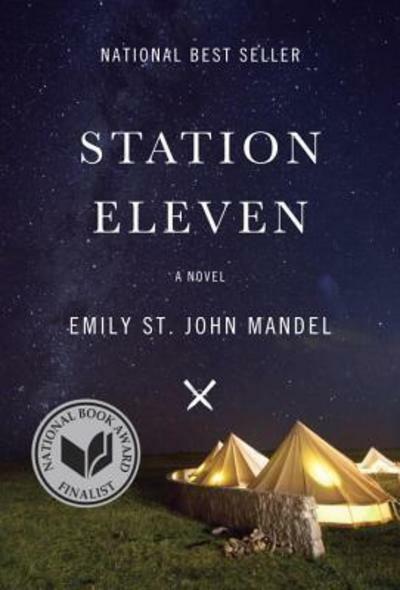 It's the story of Doctor Eleven, a scientist living on a space station named Station Eleven. Station Eleven resembles a planet, almost all of which is underwater. The comic's themes of isolation and the lonely beauty of the strange new world resonate with the survivors of the Georgia Flu. I think I might have enjoyed this book more if there hadn't been so much hype surrounding it. I had heard so many glowing reviews that it would have been hard for any book to hold up to my expectations. Don't get me wrong, it's poetic, the way the story is told is interesting, and it makes a change to read a post apolcalyptic story that isn't about zombies, but it just isn't all that and a bag of chips. I found it difficult to care terribly much about the characters, and I was hoping that the inevitable confrontation between Kirsten and the Prophet would be a bit more epic. I suppose I wanted this book to be The Reapers are the Angels, and it couldn't be because The Reapers are the Angels is already The Reapers are the Angels. Given that 99.9% of the world's population is dead, he fact that five of the survivors were connected before the pandemic is not impossible but very, very unlikely. I suppose that's not exactly a plot hole but it does seem a little contrived. Simliarly, while my view may have been coloured by the mood I was in when I read the book, the note of hope at the end doesn't ring true to me. While the characters fight to keep civilisation alive they lack medical supplies, petrol and are running out of other basic things like cloth. When all of these things are gone they will not have the skills or the wherewithal to make more, so life is going to get a whole lot less civilised within a generation or so. Then again, maybe the state of denial the characters are living in is the point. At any rate, I think there are other books which cover the same or similar themes and do it better, like the aforementioned The Reapers are the Angels by Alden Bell, Colson Whitehead's Zone One or David Brin's The Postman. Station Eleven is a ponderous, slow moving novel about the end of the world that would give a book club plenty to discuss. You could rehash old arguments about the relevence of Shakespeare in the modern world, or debate which aspects of civilisation are the most important to hang on to, or whether we should just let it all go. I wouldn't call Station Eleven the book of the year but it is worth a read at least to see what all the fuss is about.